Add an exquisite flourish of design to your beloved green space or garden by adding tiny fairy homes inter-woven with nature. 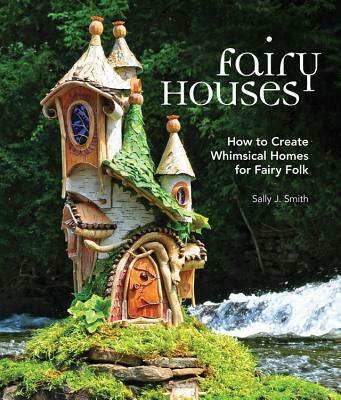 Fairy Houses gives you the instruction and inspiration you need to start! Sally J. Smith is an environmental artist and photographer living in Westport, New York, on the edge of the Adirondacks. This locale lends itself to Sally's inspiration as she creates magical, mysterious, and marvelous "faerie" houses made from real leaves, moss and stone (and many other natural materials) as well as the stunning sculptures the artist calls "Eartherials" which echo the beauty of a special place or moment in time. Sally Smith's work is regularly featured in the calendar world, as well as The New York Times feature "Leave Your Wings at the Door". Sally is also the subject of the PBS's, Sally Smith: The Fairy Queen, which aired on "Roadside Adventures." "...this recommended title is fun and unique." "this adorable book will leave even the most sceptical of readers chanting: ‘I do believe in fairies, I do!' "